Whiplash is a soft tissue injury to the neck, or a neck sprain or neck strain. It is characterized by a collection of symptoms that occur following damage to the neck, usually when the head is suddenly forced beyond the normal range of motoin. The disorder commonly occurs as the result of an automobile accident and may include injury to intervertebral joints, discs, and ligaments, neck muscles, and nerve roots. In a whiplash injury, the supportive soft tissues in your neck are often over-stretched and spinal joints will become misaligned. Why should I see a Chiropractor for a Whiplash Injury? 2. Correct the cause of the pain. What was the vector of the crash (i.e., rear-end collision, head on collision, side impact collision, etc)? Where is the exact location of the patients pain? What is the quality and character of the patients neck pain or back pain? 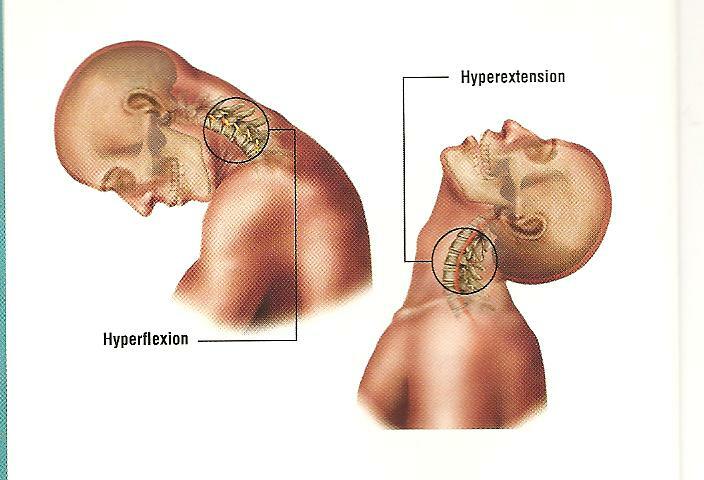 What movements, positions or activities either increase or decrease the patients neck pain or back pain? The chiropractor will conduct a neurological examination which involves a cranial nerve examination, sensory, motor and reflex examination of the extremities, and tests for injury in the brain. Orthopedic Testing will be carried out by the chiropractor that stresses certain tissues to see if they have been injured by the whiplash. The chiropractor will perform motion palpation, designed to assess the mobility and pain reactions in the joints of the spine. The muscles of the spine will be examined by the chiropractor for tender areas called myofascial trigger points, which are common sources of pain after whiplash. During this muscle examination the chiropractor will also look for gross muscle spasm. Upon what is found during this comprehensive examination the chiropractor will then determine whether any additional tests (such as x-rays, MRI, EMG or blood tests) are required. The chiropractor will obtain reports from any tests that were done through the emergency room or at previous consultations with spine specialists to avoid unnecessary duplicate testing at the chiropractic clinic. Once all the necessary information has been gathered, the chiropractor will make a determination as to the best course of action required to bring about maximum recovery from the whiplash injury in the shortest time possible. This may mean referral by the chiropractor to another specialist or a chiropractic treatment plan. Because each individual case of whiplash is different, it is not possible to generalize about chiropractic treatment. The appropriate chiropractic treatment strategy is unique to each whiplash injury and is directed at the primary dysfunctions detected during the examination. Chiropractic spinal manipulation to treat whiplash: the primary treatment for joint dysfunction. The chiropractor gently moves the involved joint into the direction in which it is restricted and may involve the application of a short thrust in that direction. In many cases, instead of a thrust, a slow mobilizing movement is used by the chiropractor. Muscle relaxation or stimulation to treat whiplash: the primary chiropractic treatments for muscle dysfunction related to a whiplash injury. They consist of gentle stretches to the muscle that has excessive tension or repeated contractions of the muscle that is inhibited. If the muscle is very tight, a more vigorous stretch may be applied by the chiropractor. Gentle finger pressure techniques may be applied to trigger points to relieve the pain associated with the tight muscles. McKenzie exercises to treat whiplash: exercises specifically designed to reduce disc derangement related to a whiplash injury. These exercises consist of simple movements done initially in the office which make for an easy transition to self-care at home. These exercises help the patient to take an active role in his or her own recovery. Stabilization or sensorimotor exercise to treat whiplash: exercise approaches designed to correct faulty movement patterns in routine activities and everyday life. They train the nervous system to better coordinate and control movement patterns, and improve the ability of the neck muscles to maintain stability of the neck. These exercises are designed to help in a major trauma, such as a fall or whiplash during a motor vehicle accident, or in "micro trauma" from simple things such as being jostled in a crowd, playing sports or performing occupational or home jobs that require physical effort. Ergonomic and lifestyle advice for a whiplash injury: suggested improvements for performing everyday activities with minimal strain to the body. The advice addresses factors in an individualâ€™s work, home or recreational activities that perpetuate the dysfunctions that result from the accident. The chiropractor may teach the patient better "use of self" and, if necessary, stress reduction methods to help chiropractic problems.